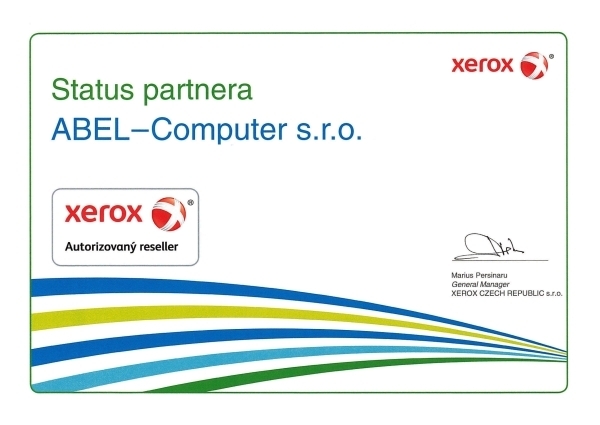 Company history | ABEL-Computer s.r.o. Historical roots of ABEL – the leader in the printer cartridge production market, dates back to 1989, when in the former Czechoslovakia, no one hoped that better times would come. At that time, the current owner of the company, had already been renovating the first needle printer cartridges for the ROBOTRON K6314 printer for his employers, and for his own needs, thanks to a permit form the then-called MNV. At this time he was still employed by the „Department of federal reserves“ where he obtained priceless experience as a programme – analyst. Because his employer was not interested in this type of service, the current company owner quit his employment and decided to establish his own company, calling it „Programming and System Service“, and offering services in the computing technology field. Like any businessman at that time, he started to provide the service from his own apartment and his basic capital was only his talent and a loan in the amount of 100,000 CZK. As far as cartridge renovation is concerned, he performed it on machines that he designed and built. 1990 He employed 4 employees. In June 1990 – he acquired a business service occupational licence and the first manufacturing shop for needle cartridge renovations and manufacturing was established in his garage. A new professional machine for printing and joining is bought with an additional 900,000 CZK loan. Family members become employees and are paid “a good salary” performing packaging and invoicing from their own apartment or garage. 1991 First two real employees, first commercial property rental and training courses are performed. 1992 On August 26th 1992, the ABEL-Computer, s.r.o. (Ltd.) Company is established by transferring the occupational licence ownership over to a legal entity- the Company. 1993 All activities are transferred under the company status – as a limited liability company. A true renovation process of needle cartridges and the sale of office equipment begins Also accredited training courses and re-qualification courses are offered. 1994 8 employees, training and re-qualification activities end. Preparations for the establishment of a branch in Slovakia begin. After the federation ceased to exists, the Slovakian market expansion became literally unachievable. 1995 10 Employees. 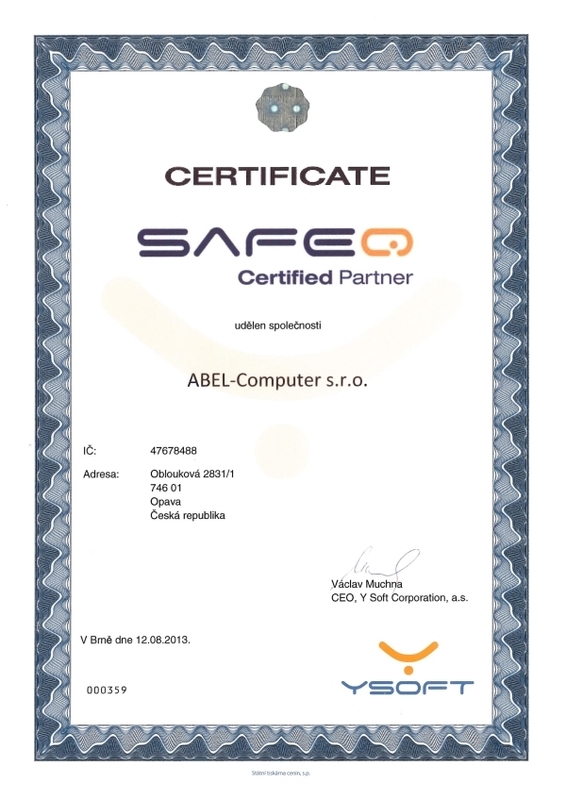 ABEL -Computer s.r.o.(Ltd.) was established in Čadca, Slovakia. The establishment process of the Slovakian branch was very lengthy and costly. The first positive results are seen only after 5 years. 1996 12 employees, ink cartridge renovation services and cartridge filling using Swiss technology, which turns out to be flawed, were added. A machine repairs, which was bought for 850,000 CZK, brought priceless experience that was later utilised during the building of our own machines to be used for ink cartridge renovation. 1997 26 Employees. A new retail store, selling office equipment was established, which increased the turnover by 74 % against the previous year of 1996. Millions of Czech Crowns are invested into new cartridge renovation technologies. 1998 49 employees. Laser cartridge renovation process began. Turnover increased by 80 % against the previous year. Additional investment was made in the development of more powerful and more sophisticated machines and equipment used for cartridge renovation. 1999 68 employees. Preparation for the renovation process of colour ink cartridge fillings. Turnover rises again by 75 % against the previous year. Commercial space rented with an area of 2 000 m². The Slovakian branch begins to prosper for the first time in 5 years. 2000 90 employees and preparation for ISO 9001; preparation for colour ink cartridge renovation, large investment into the development and research of customer care systems. 2001 113 employees. Services extended. Printer prophylaxis services offered, found partners for outsourcing, rented 2 manufacturing halls and increased the manufacturing space to 4 000 m². 2002 119 employees. Preparation for colour laser cartridge renovation, colour print technology studies, profylax offer, establishment of a customer care department, call centre and massive investments into cartridge manufacturing technologies. 2003 121 employees. Large investment into logistics, development and research. Purchase of HP-9000 renovation licence. 2004 126 employees. Current spaces were insufficient. Preparation for the purchase of a new company headquarters. 2005 156 employees including Slovakia. Purchased new property for headquarters, 17,000 m² of adjacent land for additional company expansion, preparation for its reconstruction, the intensive study of Colour Management and preparation for printing technologies is introduced. Improvement of technological cooperation during the analysis of cartridges equipped with chips. 2006 163 employees. Large investments into development and research, study of new technologies and efforts to keep current customers, as well as current market status not by talks or promises but by offering superb technological skills and above—standard customer care. 2009 Obtaining ISO 14001:2005 and the introduction of a new information system Qi. 2010 Converting data into a new information system, training of new work practices and stabilization activities in Qi. Successful re-certification of ISO 9001 and 14001. 2011 New promotional materials, revitalization of the company logo, corporate identity consolidation, extensive distribution of NPM not only to reach new potential customers, but also to inform existing customers about the growth of the company. 2012 The start of the planned reconstruction of the hall due to lack of space primarily for the storage of finished cartridges. The Slovak office obtain the status of „protected workpace“ and the extension of services on offer compensation. 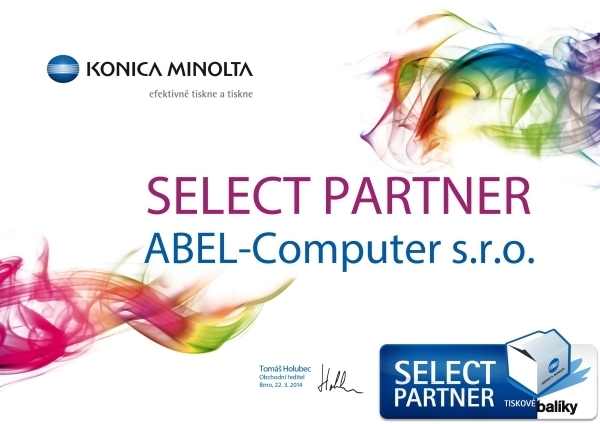 2013 Redesign of boxes for ink and toner cartridges ABEL. Site optimization and extension of the application to facilitate ordering ABEL products. Adjustment of the internal organization introducing logistics Manager.